Create a Separate Finish Area. First, remove the red "Finish" area from the Stage (Background). In the celebration" code area, we can make a sound effect, GLIDE back to the START area. Then, and most important, we want to Level Up! So, third, create a VARIABLE called "Level". We must keep track of levels, so we can make the game harder has the levels go up! So, into our celebration code, we want to add "CHANGE LEVEL BY 1". Now that we're this far, adding Points is super easy! Create a Variable called Points! Start the game with zero points. Add some points in the celebration area. Take away points in the "Frog is dead" area. And you get to choose how many points are added or taken away! And remember negative numbers from Math class? Here's another time that we need them! Don't know what code blocks to use? Here they are! Familiar with making variables now? Great! 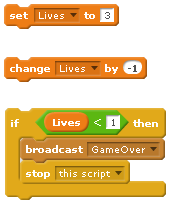 Create a variable called "Lives". Set the Speed to Increase on "Level Up"
Now, life starts to get complicated! What should we do to make different levels harder? Create a variable called Speed. Every 3rd level, increase the speed by 1. Then, just to make our lives easier later (but more complicated now), let's add a BROADCAST "Level Up" every time we celebrate touching the Finish area!